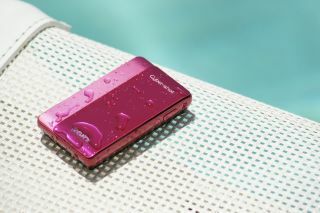 Sony has announced its first-ever waterproof Cybershot to come to market – the Sony Cybershot TX5. And if that wasn't enough of a world first, Sony is touting the TX5 as the world's slimmest waterproof camera as well. And at 17.7mm it's as skinny as a journalist's wallet. The TX5 houses a 10.2MP Exmor R CMOS sensor and also has 4x zoom capabilities, 720p HD movie shooting and a 3-inch LCD touchscreen. If you were to test the TX5 to the extreme, Sony assures us that it would be able to handle temperatures as low as -10 degrees Celsius, water depths of 3m and you can drop it from a height of 1.5m without the fear that you've just borked your brand-new camera. Features on-board include Sony's rather marvellous Sweep Panorama mode and 10fps burst mode. Sony also announced the arrival of the H55. It may not be waterproof, but it does have some super-zooming capabilities. Brandishing a 14.1MP sensor, the camera can zoom optically up to 10x and will stop shake due to its Active Mode feature. Thankfully Sony has also opted to add an SD card slot to the cameras, so you can use the cards you have lying around rather than resort to the company's proprietary Memory Stick media. If you want to use Memory Stick, though, there is an option for this too. The new Cybershot DSC-TX5 and DSC-H55 have a UK release date of March 2010. Pricing is still to be confirmed.